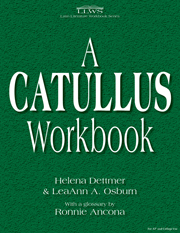 The complete Latin text of Catullus poems 1–5, 7, 8, 11–14, 22, 30, 31, 35, 36, 40, 43–46, 49–51, 60, 64. 50–253, 65, 68–70, 72, 76, 77, 84–87, 96, 101, 109, and 116 (a total of 771 lines). Multiple choice questions on grammar, syntax, figures of speech, content, etc. Reinforce Catullus' grammar, meter, rhetorical devices and much more in this workbook.